PS lowers levels of the bad stress hormone cortisol. Suggested dosage: 100 to 300 mg per day. 600 mg per day for those with neurological impairment. One can notice the benefits of PS on memory and cognitive skills, and it benefits the brain on a cellular level as well. The brain contains more fat than any other organ, excluding the kidneys. Each cell membrane is lined with fat and is vulnerable to oxidative free radicals like peroxi-nitrates. PS protects the brain from oxidation and neurological toxins that cause brain-aging and the loss of cognitive skills. PS enhances all aspects of brain cell metabolism. A soy product, this natural lecithin extract is a dramatic neurological protector. PS has been known to slow the rate of brain cell aging, restore mental function in older animals, improve cognition and increase levels of acetyl-choline. 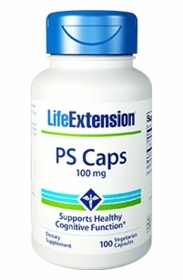 PS improves cell to cell communication and protects the brain against age-related compounds that cause neurological impairment. Phosphatidylserine can dramatically slow and even reverse the rate of brain cell aging in laboratory animals. Phosphatidylserine restored mental function in older animals to levels exceeding those found in some younger animals. Although studies in humans with Alzheimer's disease were less dramatic, they still produced significant improvements in cognitive function. In patients with mild dementia, significant cognitive and behavioral enhancing effects were observed, suggesting "global improvement in patient performance", according to one scientist. In one study with mildly demented elderly patients, the improvement in neurological function continued 30 days after discontinuing phosphatidylserine (PS) therapy. This suggests that relatively low doses or cyclical dosing of PS therapy over an extended period of time in healthy people may produce sustained anti-aging results. What excites us most about phosphatidylserine is its unique ability to initiate, maintain, and enhance all aspects of cell metabolism, which makes PS one of the most promising all-around anti-aging therapies available. New research shows that in addition to improving neurological function, PS enhances energy metabolism in other cells of the body. In addition to these cell energizing effects, PS also helps maintain brain cell membrane integrity and youthful synaptic plasticity. This means that PS protects cells against the functional and the structural deterioration that occurs as a result of aging. Sharp'S® is a registered trademark of Enzymotec, Ltd.